The Loggerhead Shrike is unusual among songbirds in that it is a predator of large insects, lizards, mice, and other birds. It uses its hooked bill to kill prey and then often impales them on thorns or barbed wire so that it can rip them apart. This species was once fairly common but has been declining rapidly for the last several decades in Tennessee. Rangewide it is estimated that the Loggerhead Shrike has declined by 71% in the last 40 years. The problem appears to be the loss of farmland to development or succession into forest, more intensive agriculture with clean fencerows (no trees and shrubs), and pesticide use. The current breeding range is in the central and southern United States and Canada southward to Florida and southern Mexico. In winter it leaves the northern parts of the breeding range for the southern half of the United States and Mexico. It is a rare year round resident in Tennessee. Description: This robin-sized, gray songbird has a relatively large head, a black mask on its face, and a stout, slightly hooked bill. The throat is white, the chest is pale gray, the tail is fairly long, and is black with white outer feathers. The wings are black with white patches, which are especially obvious in flight. Males and females look the same. Northern Mockingbirds are similarly colored, but lack the black mask, have a narrow, pointed bill, a smaller head, and a longer tail. Shrikes appear much chunkier and when in flight, fly with short, fast wing beats. Habitat: Short grasslands with isolated trees or shrubs, including pastureland, cropland, and old fields. Diet: Insects, amphibians, small reptiles, small mammals, and birds. Nesting and reproduction: In Tennessee, males reoccupy territories and start singing in late winter. They are more likely to return to a previously used nest site than the females. Egg laying begins in late March and peaks in early to mid-April, and pairs will frequently raise a second brood. Clutch Size: Usually 5 to 6 eggs, with a range of 1 to 9. Incubation: The female incubates the eggs for 17 days, and is fed by the male. Fledging: Both parents feed the young, which leave the nest after 19 days. Fledglings are dependent on the adults for another 3 to 4 weeks. Nest: Both adults build the relatively large, bulky, cup-shaped nest of sticks, twigs and weed stems, and line it with finer material. Nests often contain human-made materials such as string. The nest is usually well hidden in a shrub, or a vine tangle in a tree, or especially in Tennessee, in a Red Cedar tree. Nest heights range from 4 to 30 feet above the ground, with an average of 10 feet. 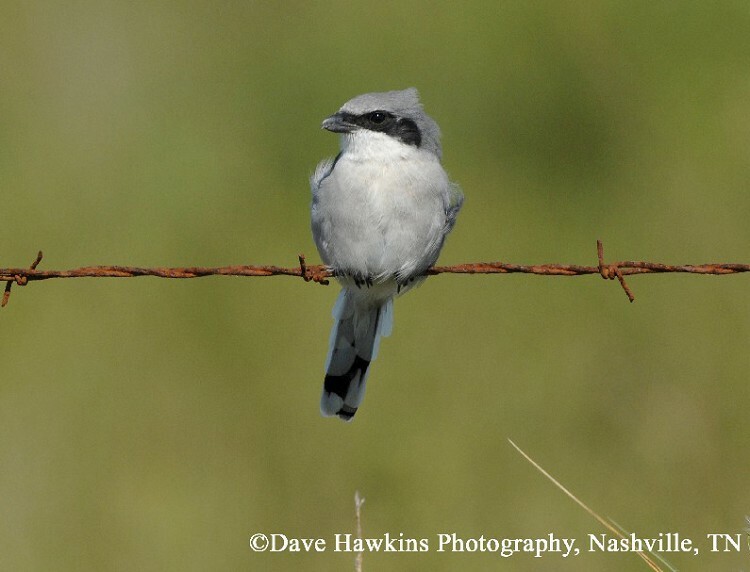 Status in Tennessee: The Loggerhead Shrike population in the state has declined significantly since the beginning of the Breeding Bird Survey in 1966, and is listed as In Need of Management. It is an uncommon to rare year-round resident in the state, with numbers increasing from east to west. More northerly breeders join resident birds during the winter. In some areas, the Loggerhead Shrike has earned the name "butcherbird" for its habit of using thorns, barbed-wire, and chain-link fences to impale its prey to either rip apart and eat, or cache for later. The Loggerhead Shrike has been virtually eliminated from the northeastern United States, and a subspecies on San Clemente Island in California has been listed as Endangered since 1977. There is a captive breeding and release program to help increase their numbers. The oldest known Loggerhead Shrike in the wild was 6 years, 1 month old. Best places to see in Tennessee: Recent surveys in Tennessee found Loggerhead Shrikes to be most frequently encountered in the Amish community in Lawrence County, and in Lake and Dyer Counties in northwest Tennessee. White County also has a few breeding shrikes remaining. Yosef, R. 1996. Loggerhead Shrike (Lanius ludovicianus), The Birds of North America (A. Poole, and F. Gill, eds.). The Academy of Natural Sciences, Philadelphia, PA, and The American Ornithologists' Union, Washington, D.C.